" Strids Mølle is located where the lakewaters of Bavelse Sø flow into the Suså river. At this site, a cluster of no fewer than five Stone Age tombs remains preserved: three long barrows, a round barrow and a passage grave. 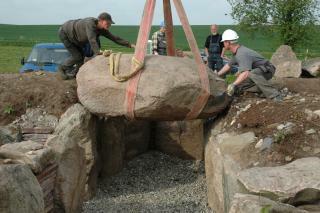 The passage grave is the most recent and dates back around 5,200 years. The barrows are slightly earlier; approx. 5,600-5,300 years old. Two of the long barrows are of the earliest type in which the burial chambers are aligned lengthwise in the barrows, sealed by large capstones. The third type of long barrow is a slightly later type, in which the chamber lies crosswise. This site is a necropolis, a burying ground used for Stone Age burials for several centuries. " " When the passage grave was restored in 2005, traces were found of a filled trench beneath the floor of the grave. The trench continued outside the barrow and is thought to be from an even older type of burial site; a so-called unchambered long barrow or long mound. The unchambered long barrows were introduced in Denmark by the earliest farmers and date back to the birth of agriculture around 6,000 years ago. When Stone Age Man abandoned unchambered long barrows in favour of chambered passage graves, it may have been due to a change in religion or because the land was taken over by people with new customs. "